My parents bought 10 Shouldham St as a London flat in 1967, when I began work at Millers and Piers was starting his doctors' training at The Royal London Hospital in Whitechapel. The flat was bought from Anthony and Jane Whinney - Jane being the daughter of James Wright, then one of the senior partners of Millers, who my father had got to know through shooting. Anthony was with Linklaters, but had decided to give up soliciting and become a farmer in the West Country. The flat cost £7500 - quite a large sum in the days when a managing director's annual salary was £5000 and mine was £1005! 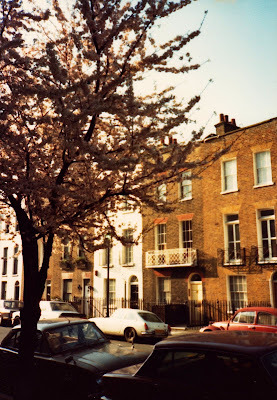 The street was a quiet Georgian terrace just off Bryanston Square with the Seymour Baths, a public laundry and some police married quarters on one side. The location was ideal for commuting into the City and Whitechapel (from Edgeware Road tube station) and it had some interesting residents, a few of whom became friends - like Tony Daniels (the actor who played C3PIO in Star Wars who was our immediate neighbour) and a gay senior civil servant who had a Columbian boyfriend - and others. The flat was quite small, on two floors and with a useful roof terrace, and Piers and I lived there together for about three years, before he finished his London training and moved to Christchurch. He had a piano in his room, having become an accomplished pianist and organist while at Stowe. I joined the Territorial Army in 1969 and spent Tuesday evenings at the Duke of York's Barracks in the King's Road and many weekends on the Brecon Beacons and the moors above Newcastle. See here for a note of my TA activities. After Prue and I married in 1971 and moved into Harvestgate, the flat was used less and was never let. My parents used it from time to time when visiting friends in London, and my friends such as Nick Duke and Charlie Skipwith were regulars. Charlie had his Lotus Cortina stolen from the street when he stayed there once and Nick Duke and I used to use it as a base from which to seek out London's best breakfasts after his dinners at the Farmers' Club. I lived in it again full time with Ayako in the 1980's and we did it up a bit, making a garden on the roof. When Kei was born in 1989 it was a little small and was finally sold in 1991.